Click here to get PilotFAR! 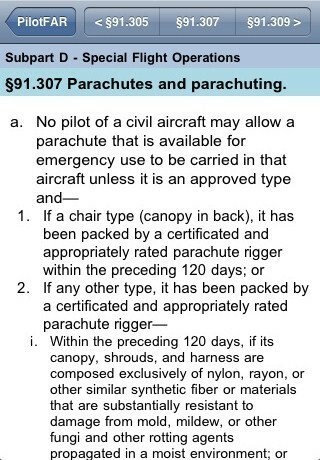 Why carry around a 3-pound book of Federal Aviation Regulations when you can have them all on your iPhone or iPod Touch, in searchable format? 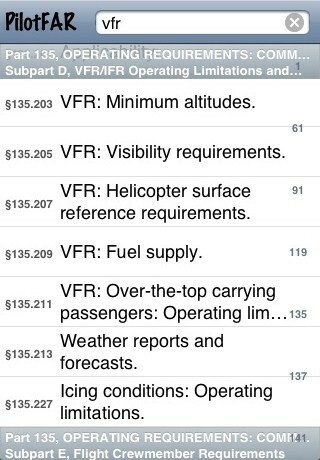 PilotFAR includes the electronic text of all the FAR’s relevant to pilots, including Title 14, Parts 1, 43, 61, 63, 65, 67, 71, 73, 91, 97, 103, 105, 119, 121, 133, 135, 136, 137, 141, and 142. 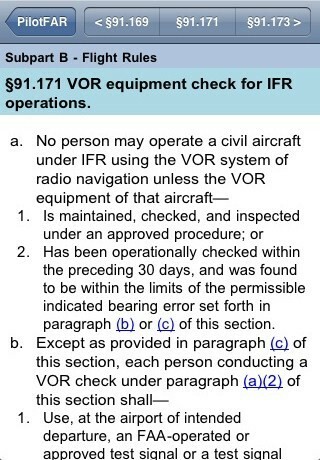 Also includes NTSB-830. PilotFAR enables you to quickly locate the information you need. The main screen lists sections by part. Tapping a section takes you to the section entry, and from there you can view the text of the entry, and move forward and backward through the regulations. Enter a search-filter to narrow the main index to topics containing the term or terms your looking for. When you access a filtered section those terms will be highlighted for you! Can’t remember whether servicing your landing gear is considered preventive maintenance? 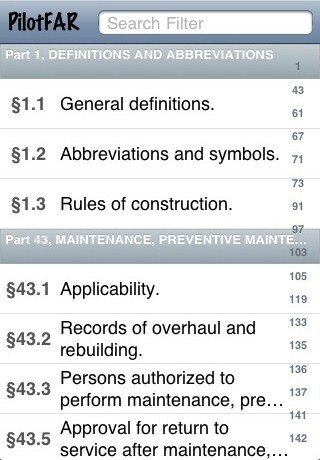 See Part 43, Appendix A. Is it legal to drop an object from a civil aircraft? See Section 91.15. 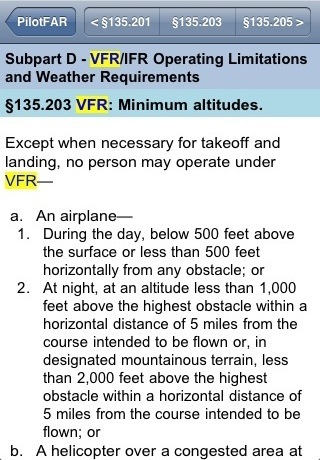 Need to know the requirements for an Instrument Rating? See Section 61.65. PilotFAR is perfect for student, GA, and professional pilots. Get a copy today and impress all your (pilot) friends! Please contact us at support@codeveloper.com!